After turning pro in the year 2000, Julien Benneteau has had a long career that includes reaching the top 25 in the world. 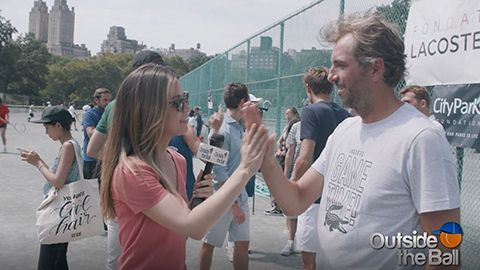 Benneteau announced 2018 would be his last year on tour, and Outside the Ball couldn’t let Julien leave without releasing never before seen clips from our interview with him in August where he poked fun at fellow player Nicolas Mahut and spoke about ending his career. Tennis fans were able to enjoy Julien and his game one last time as he returned to the court in the following month for the Davis Cup semi-finals that sent France into the final round against Croatia. We thank Julien Benneteau for playing tennis, inspiring so many people, and joining us at Outside the Ball! Is Grigor Dimitrov Joining a Boy Band? Watch Dimitrov Get His Groove On to the Backstreet Boys.